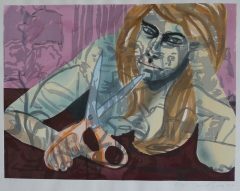 David Salle painter, print maker and stage designer, born in Norman, Oklahoma. At the age of eight or nine, he began taking life-drawing classes at the Wichita Art Association. During high school, he attended outside art classes three days a week. In 1970, he began his studies at the newly founded California Institute of the Arts in Valencia, where he worked with John Baldessari. Salle began creating abstract paintings, installations, and video and conceptual pieces, in 1973 he was awarded an BFA and an MFA in 1975, both from CalArts. His first solo show was in 1979 at the Gagosian/Nosei Webber, New York, USA. Major exhibitions of his work include Whitney Museum of American Art in New York, the Stedelijk Museum in Amsterdam, Museum of Contemporary Art, Los Angeles, Castello di Rivoli in Italy and the Guggenheim in Bilbao, Spain. Solo shows of Salle’s art have been organized by the Museum am Ostwall Dortmund (1986–87), Institute of Contemporary Art at the University of Pennsylvania in Philadelphia (1986–88), Stedelijk Museum in Amsterdam (1999), and Waddington Galleries in London (2003), among others. He has participated in major international expositions including Documenta 7 (1982), Venice Biennale (1982 and 1993), Whitney Biennial (1983, 1985, and 1991), Paris Biennale (1985), and Carnegie International (1985). The artist lives and works in New York City and Sagaponack, New York. He presently lives and works in New York City and Sagaponack (Long Island).